Thanks, but this is an old discussion...snif! No, the baby seal that is smilling too! Thanks...but it the baby seal, not me! yes is it you ? The baby seal? Eheh! No, it is not me! Eheh, old discussion, I was talking about the baby seal! Old discussion, eheh. But thanks! Thanks, but I was talking about the baby seal. Grrrr.... I was talking about the baby seal. Thanks. I like my baby seal too. Yes it's lovely, but I like the baby seal more. 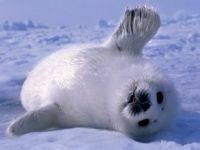 I like the seal, and I like your picture, too--a nice, smiling, happy face! yes i like you avatar! Is that actualy you? I think it is a nice avatar.